Yahoo: Omnivision combines all its technologies in the new 1/4" 5MP sensor based on 1.4um BSI pixels. The new OV5642 uses TrueFocus EDOF ISP with all camera functions integrated, including anti-shake engine for image stabilization, thumbnailing support and Scalado tagging for faster image preview and zoom. Surprisingly, the new sensor also features an embedded AF controller (EDOF not enough?). The AF mechanism can be controlled via the general purpose I/O (no AF motor driver on chip?). Omnivision keeps mum on its BSI pixel performance figures, other than saying that the pixel sensitivity is better than 500mV/Lux-sec. The OV5642 can output video in full resolution at 15fps. It also supports 720p HD 60fps and 1080p HD video at 30fps. The OV5642 also offers Bridging and Daisy Chain support, which allow secondary cameras to share the use of its ISP via the digital video port (DVP), while providing continued output through the dual-lane MIPI interface. The OV5642 will be available for sampling in the coming weeks, and is expected to go into volume production in the first quarter of 2009. Siliconfile puts quite a detailed description of its CIS process tricks in US20080224187 application. One can see that Siliconfile engineers have quite a deep process knowledge. The proposed economical method of photodiode formation does not have whole the flexibility of more complex techniques, but it definitely gives the company an advantage in mask count. TSMC application US20080224247 talks about BSI sensor backside passivation scheme. TSMC proposes to form an additional shallow p-n junction on the backside, which effectively isolates the backside surface traps from the main photodiode. Micron application US20080225144 proposes to use image sensor array as a memory in addition to its sensor. Each photodiode can serve as a multilevel storage node. The idea is very old and I doubt the new patent would be granted on it. Kodak application US20080225148 exploits an old idea of saving select transistor in 4T pixel. But what is interesting there is the proposed pixel layout. If Kodak pixel really looks as on Fig. 5, it should have huge crosstalk due to capacitive coupling between neighboring floating diffusions (one needs to stack two Fig. 5 pictures horizontally so see this). Pixel designers, don't do that! 6mpixel.org started BIOS-Pixel Initiative on Photokina 2008 (BIOS = Better Instead Of Smaller). The initiative is supported by the German test lab Image Engineering, the magazine ColorFoto, the online magazine heiseFoto.de and Ringfoto, a dealer association. One problem with their approach is that they use unified lighting conditions and test chart to check "good pixels". In fact, "good" or "bad" pixel quality depends on a lot more things, such as illumination, scene, lens quality, AF quality, AE quality and many other factors. So, with all these factors unaccounted, the tests, that the Initiative proposes, have very limited value to me. Yahoo: Kodak reports that new LEICA S2, HASSELBLAD H3DII-50, and SINAR Hy6-65 - are based on both new and existing KODAK CCDs, and establish Kodak as the leading supplier of image sensors used in professional photography. LEICA S2 camera, powered by the new KAF-37500 Image Sensor, is the third product from Leica to be based on Kodak CCDs. The new KODAK KAF-50100 Image Sensor was selected by Hasselblad for use in the HASSELBLAD H3DII-50. Sinar has selected 31.6MP KAF-31600 Image Sensor for use in the SINAR Hy6-65. KAI-50100 and KAF-37500 are based on 6um pixel. DALSA too reports that its 6um pixel CCDs are "at the heart of the newest, highest-resolution and highest performance medium format digital camera systems". Probably it means Leaf digital back, as I'm unable to see any other recent DALSA-based camera announcement. 2009 International Image Sensor Workshop published Call for Papers. 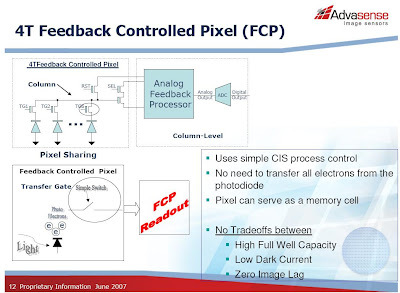 -CCDs, Active pixels, CMOS, CIDs, APD array, etc. Yahoo: Kodak adopts Acceleware Cluster hardware accelerator for Synopsys Sentaurus TCAD. Kodak uses Sentaurus to simulate its pixel design, including FDTD optical simulations. Acceleware's technology enables high-speed parallel processing of the FDTD algorithm on clusters of GPUs, which reduces computation time for these simulations from days to a few hours or less. Rensselaer: Researchers at Rensselaer Polytechnic Institute have designed and tested an adaptive liquid lens which is said to require considerably less energy to operate than competing technologies. The lens is made up of a pair of water droplets, which vibrate back and forth upon exposure to a high-frequency sound, and in turn change the focus of the lens. By using imaging software to automatically capture in-focus frames and discard any out of focus frames, the researchers can create streaming images from lightweight, low-cost, high-fidelity miniature cameras. “The lens is easy to manipulate, with very little energy, and it’s almost always in focus — no matter how close or far away it is from an object,” said project leader Amir H. Hirsa, professor and associate department head for graduate studies in the Department of Mechanical, Aerospace and Nuclear Engineering at Rensselaer. Mobile Handset Design Line: Tessera continues its 4-part series of articles on mobile imaging. Part II promotes Tessera wafer level packaging, wafer level optics and wafer level cameras as the best solutions for camera module design challenges. Yahoo: Aptina announces 5MP SOC with 1.4um pixel design and a 1/4” optical format. The new MT9P111 sensor is targeted to 8.5x8.5mm modules. It features 720p/30 video, on-chip JPEG compression to reduce bandwidth demand on system, on-chip AutoFocus driver for fast focus response time and second generation motion adaptive exposure control (anti-shake) to capture clear images. The MT9P111 also supports Scalado Speedtags. It is currently sampling to select customers and production is scheduled for late Q1 2009. Yahoo: Aptina also announces 10MP sensor for digital still camera, digital video and hybrid camera applications. It's based on new 1.67um pixels. The MT9J001 sensor features 1/2.3” optical format, and a parallel/serial frame rate of 7.5fps (parallel) and 15fps (serial). MT9J001 is the first product to integrate Aptina’s High-Speed Serial Pixel Interface (HiSPi). This high bandwidth serial interface is based upon the JEDEC SLVS signaling standard and enables faster data transfer rates (up to 2.8 Gbps). Aptina’s new sensor features for-lane HiSPi and allows a camera to capture and process data in HD (1080p/60fps). Additionally, the new 10MP sensor is the first of Aptina’s high performance sensors with digital re-sampling after binning. This re-sampling feature removes binning artifacts seen in 2x2 binned images and matches the distribution density of the original unbinned image. HiSPi interface is developed and owned by Aptina Imaging. The open access, scalable technology enables 1080p/60 fps performance (and beyond) and has been adopted by many of Aptina’s business partners. HiSPi technology provides distinct benefits for users including open access to a performance focused interface, the ability to support 1080p/60fps today—4X the data rate of standard broadcast (DI)—and the scalability to accommodate higher data rates for the future. Samples will be available in 4Q08 and limited production begins in 1Q09. Digitimes: Taiwan-based module maker Creative Sensor Inc. (CSI) announced the opening of its US$30 million Nanchang plant in China. Over the years CSI has expanded its production in China, first setting up a subsidiary, Wuxi Creative Sensor Technology in Eastern China in August 2002, followed by a second Wuxi subsidiary in 2004 and then beginning construction at its Nanchang plant in 2007. CSI is known to produce Varioptic liquid lens. CSI estimates it will start liquid lens shipment at the end of October to the US and Japan. Previous estimates were production start in 2006 and 2007. Yahoo: Omnivision introduced the world's first 1/3", 8MP BSI CMOS image sensor. The new OV8810 is the company's first product to use its recently launched 1.4um OmniBSI backside illumination technology. The 1/3-inch OV8810 is small enough to fit within an 8.5 x 8.5 x 7 mm camera module. The sensor's BSI architecture not only enables a reduced die size, but also a lower stack height, which means it can achieve a higher chief ray angle (CRA). The sensor's speed in full 8MP resolution is 10fps. It captures 720p HD video at 60 fps, or 1080p at 30 fps. In QVGA resolution, the sensor can achieve data output at 120 fps, good for slow motion video. The OV8810 supports 8-/10-/12-bit RAW RGB data over a 2-lane high speed MIPI interface or parallel interface. The OV8810 will be available for sampling in the coming weeks, and OmniVision expects to begin volume production in the first quarter of 2009. So, sampling begins in "coming weeks" instead of the past June. I hope this delay allowed Omnivision to solve all the technical problems. 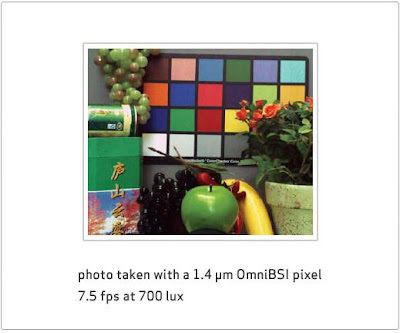 1.4um pixel uses lightguide to outperform "today’s leading-edge 1.75-micron pixels". The new process will be also applied to 1.75um pixel to improve its sensitivity by a factor of 2. The improved 1.4um pixel and enhanced 1.75um pixel products will be in production the second half of Q4. Yahoo: Tessera offers Product Launch Services to accelerate the introduction of products that integrate its technology-based solutions, while the supply chain ramps up for high-volume production. The new Services include access to the company’s medium-volume manufacturing facility for both standard and customized lenses. The first product deployed under Tessera’s Product Launch Services is the OptiML WL-VGA-1E, a single-element VGA lens for cell phone camera modules. The WL-VGA-1E is a reflow compatible, two-surface, lead-free lens designed to work with 2.2µm pixel VGA image sensors. The lens includes an integrated infra-red filter. Samples of the WL-VGA-1E single-element lens are available for purchase now. Pricing of samples for qualified customers starts at $1/lens for quantities of a few thousand. In early 1Q09, the product will ship in quantities of 100,000 and more. EETimes adds more about the new service. It is to be based on the wafer fab of Digital Optics Corp. in Charlotte, NC. Tessera acquired Digital Optics in 2006. The third change is dual exposure HDR, similar to one appeared in CMOS sensors. The two exposures are combined together into a high dynamic range picture. With slower CCD readout speed I assume this is harder to implement, but it looks like Fujifilm engineers managed to to it. Actually, dual exposure CCDs for security have been available for a long time. But Fujifilm is the first to expand the concept to consumer market. Remember Sarnoff CMOS Sensors group? In 2002 it was acquired by Germany-based Dialog Semiconductor. In 2006 Dialog spun-off its imaging group as Dialog Imaging Systems. The new company decided to concentrate on camera-phone market and licensed Carl Zeiss lens to use in its modules. In 2007 Dialog Imaging Systems renamed itself to Digital Imaging Systems (DIS), probably to break all ties with Dialog heritage. Lens F# is 2.8 (5.6 with aperture enabled) - I'd guess it uses ND instead of iris to improve lens diffraction. The site also has spec of 2.75X optical zoom version of 9MP module - DS6951. However, it was not announced so far. In the past Dialog used to use IBM as its CIS foundry. Now, with IBM CIS team disbanded, I wonder who manufactures the sensors for DIS? Swiss-made Sensors journal published its special issue "Integrated High-performance Imagers". All papers from the issue are available in open access. Tech-On: Canon announced its first non-DSLR camera with in-house designed CMOS sensors. So far Canon used only CCDs in its compact camera range. The 11.8MP sensor is based on 1.7um pixels. The article says that "Canon is highly likely to use the in-house CMOS sensor for almost all of its compact cameras. Canon apparently intends to carefully expand the scale of mass-production." Initially CMOS-based PowerShot SX1 IS camera production plans are 50K units per month. Another new Canon sensor is intended for full-frame DSLR. It has 21.1M of 6.4um pixels. Both sensors support 1080p/30fps video. The presentation also tells a little bit about image stabilization feature: "A series of short exposed images are captured, aligned and summed up in the same pixel array. Pixel array is used as memory during the stabilization process"
I have not written these weekly reviews for a while, in part because I have not seen any noteworthy ideas in the weekly application stream. However, this week I feel I must do it. Among 28 image sensor related US patent applications published this week, there are two that look quite similar. They are filed just 3 days apart. TSMC application US20080217659 promises to improve small pixel crosstalk and blooming. Micron's US20080217716 also reduces dark current. Both are achieving their goals by separating photodiode anodes from the substrate by means of N-type epi layer. About the only difference that I was able to spot is that Micron uses P-type substrate, while TSMC uses N-substrate. Once the anodes are isolated from the substrate, one needs to bring a reliable ground potential to them. This is what Micron application US20080217718 about. It proposes to add ground contact to each pixel or only some of them. I highly doubt it would be granted though, as there is a lot of prior art on that. TSMC application 20080217719 explains how to reduce crosstalk by adding an additional implant between the pixels. Nice try, but I afraid that prior art prevents this application from being ever granted. Another interesting application came from Teledyne. Teledyne acquired Rockwell Scientific in 2006 to create Teledyne Imaging Sensors. Then, in February 2008 Judson was acquired and merged with the new business unit. 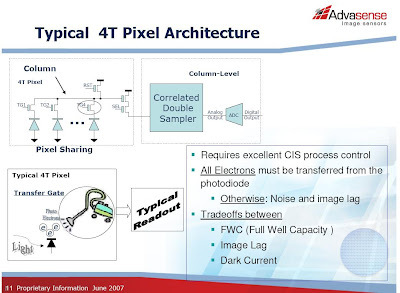 Teledyne application US20080217661 proposes 2D TDI imager based on 4T CMOS pixel with double transfer gate. Very nice idea, except that I could not understand how they read TDI charge packets at the end of integration. Now, if Teledyne manages to scale the pixel size down and adapt its TDI to bayer pattern, we would get a very efficient image stabilization for the mainstream applications. Teledyne also applies for BSI patent US20080217723. The main idea is to apply a voltage between front and backside of the wafer, so that photocarries would drift, rather than diffuse through the thick substrate. Sounds great to me, apart from the power consumption spent on the maintaining of electric field in the substrate. Tessera marketing creates more and more articles to promote its wafer scale camera and other solutions. Embedded.com article says that future mobile camera growth mainly comes from the secondary and tertiary cameras. The resolution of these cameras is unlikely to grow beyond VGA, according to Tessera. Thus, Tessera wafer level camera package with integrated lens has bright growth prospects, even though it can not address high resolutions for now. Digitimes: Aptina 8-inch fab in Italy does not have capacity to fully meet demand from notebook makers. High iPhone 3G sales are named as a major reason for Aptina limiting notebook orders. The cameras for notebooks market has a big growth potential. So Digitimes thinks that Aptina might hurt its future prospects by not giving it high enough priority now. Samsung's new products are produced using TSV. Digitimes sources say that "customers only need to add a controller IC to complete the camera module." - I don't understand this statement. Probably they mean ISP. Yahoo: Advasense, a start-up company from Israel, announces its first product - 5MP 1/4" sensor based on 1.4um Feedback Control Pixels. This technique is said to improve the pixel performance because charge transfers and fully pinned photodiodes are not required. The sensor is intended for mainstream camera phone applications. On-Chip integrated image stabilization "using the pixel array as a memory array to compensate for inadvertent hand motions". Advasense use deep photodiodes with full well "comparable with, or better than the capacity of 2.8-3.2um pixels." - This looks like a major achievement, as full well is one of the top limiting factors in pixel scaling. So, we are finally seeing a start-up company coming with small pixels to compete with big guys. Quietly, with no official announcement, Aptina site now shows its new CEO: Nicholas E. Brathwaite. Nic is also a Founding Partner of Riverwood Capital LLC, a private equity firm in Palo Alto, California. Also he is a member Boards of Directors of Tessera and InSilica. Tradevibes also says that Nic sits in the boards of Photon Dynamics, Teak Technologies and Power Integrations. Prior to Aptina Nic was the CTO of Flextronics and spent 13 years managing and leading the development of several products before his retirement in 2007. Nic joined Flextronix with acquisition of nChip. Before nChip Nic worked for Intel. How is TransChip Doing Inside Samsung? The Chosun Ilbo reports that Samsung dispatched one or two of its executives to the acquired Transchip, but retained management. And core staff at TransChip have been given loyalty compensation in the tens of thousands of dollars. As a result, existing staff continue to work at TransChip with hardly any turnover. Samsung acquired Transchip in 2007. The paper thinks that the Transchip integration into Samsung is an example of success. EETimes: American Technology Research analyst Doug Freedman tells that Micron is re-thinking the spin-off of its Aptina unit. "Private equity financing remains difficult to obtain," Freedman said. "In a change from the May quarter earnings call, Micron has decided to stop waiting for a planned private equity ownership of the Aptina sensor unit, and explore other opportunities to separate this non-core business. We believe that prior options are being reconsidered, including a direct path to going public." To me, this is somewhat expected. With no clear technical leadership Aptina is competing on price with "me too" products. In such a situation it's hard to get favorable terms from VCs. I'm not sure that IPO is a good solution either. TI Officially Launches its "Pixim Killer"
Yahoo: TI officially announces TC922 high sensitivity WDR sensor. Each 5.6um pixel has a photodiode and a Lateral Overflow Integration Capacitor (LOFIC), which can hold a large number of photoelectrons for very bright lighting conditions. The LOFIC technology enables the sensor's dynamic range to reach 94dB. TI has been developing the WDR sensor based on LOFIC technology with Tohoku University Prof. Shigetoshi Sugawa Laboratory. The sensor is said to be able to handle the photo-signals from several to approximately 200K electrons by single exposure. The first customer for the sensor is SANYO Electric, using it in WDR cameras range. TI also offers IP camera reference design with the new sensor. The new TI sensor is aimed on the HDR market that is currently dominated by Pixim. Omnivision too recently announced HDR sensor for automotive and security markets. With these new entries, the market becomes quite crowded. First and foremost this puts Pixim in danger, as it has much less resources to compete with its rivals. Video/Imaging Design Line: Kodak announced KAI-02150 CCD providing 1080p video at 60fps rate. The CCD is unusually fast for such a high resolution device. The article does not tell how many parallel outputs this CCD has. It's based on 5um pixels and fits to 2/3" format. The price is $425. Engineering samples are currently available, with volume production planned for Q4 2008. TI Japan publishes a presentation and a flyer of its TC922 WDR sensor for security applications. The 800x600 resolution sensor is based on 5.6um pixels. The DR is 94db. The sensor's supply voltage is 5V (I wonder what is the process used). SUSS MicroTec announces world's first production-grade wafer bonder specifically optimized for BSI and 3D-integrated image sensor manufacturing. The bonder is presented at Semicon Taiwan, starting today. The BSI industry seems to wind-up. The bonder is designed for 300mm wafers, while most of the image sensor production today uses 200mm. This might limit the bonder use in the short term. Università di Catania, Italy enjoyed ST delivering a high-level presentation on available solutions for camera modules, including sensors, AF possibilities and ISPs. The first few pages of the presentation are in Italian, then it switches to English. Update, Sep 9: The file has disappeared from the site, even though the link to it is still on the presentations page (see part 10, pdf 2). Applied Color Science compares "black sun" effect between Omnivision OV5610 and Micron MT9P401, both 5MP. It occurs when a camera is pointed at a scene with a very bright, very concentrated source of light like the disk of the sun. Some CMOS sensors show these super-bright areas as dark, rather than saturated bright. The result of the comparison is that MT9P401 sensor is free from bright image inversion, while OV5610 suffers from it. One needs to note that Omnivision's sensor belongs to 2.8um pixel generation while Micron's is 2.2um. The newer Omnivision sensors might behave differently. The site also has a simplistic explanation of why "black sun" happens. Chipworks published a reverse engineering report on Toshiba TSV. Toshiba is the first out with a commercially available device that uses TSV technology. They call their implementation, "TCV" for Through-Chip-Via. This allows mounting and assembly of camera components at the wafer level (WLP), savings overall module size and yielding smaller design footprints. Update, Sep. 15: Marketwire: Chipworks announced the availability of a full reverse engineering report on Toshiba's TSV technology. (The previous announcement was probably a preliminary report.) The analyzed device is an image sensor module, produced by Toshiba, and found inside a mobile phone. According to market research company Yole Developpement, "3-D TSV wafer level encapsulation technologies have the potential to impact as much as 70% of the CMOS image sensor market for camera cell phones by 2012." Digitimes sources report that Aptina is negotiating with Taiwan wafer fabs and DRAM makers to outsource its image sensor production. Currently, Aptina uses Micron's 8-inch fab in Italy. Although this fab is satisfying Aptina's demand for now, with the company anticipates more notebook and handset image sensor orders, it will face a capacity shortage in the next few quarters. TSMC and Nanya 8-inch fabs are among the candidates. Aptina pans to finish certification of the new partner's manufacturing process by the end of this year and will likely start utilizing the new capacity in 2009. Digitimes: Omnivision announced that it plans to increase its image sensor wafer starts to boost capacity, including high-end sensors, and to produce a new generation of VGA-resolution sensors. Digitimes' industry watchers explained the move as the company's strategy to regain its CMOS image sensor market share that may have been eroded by competitors from China. Digitimes' industry watchers suggested Omnivision attempts to regain market share in the China white-box handset market amid the rising threat from rival SETI. They believe that Omnivision is likely to achieve its goal as its new generation VGA sensors are smaller in size, so they are supposed to be cheaper. Digitimes sources tell that five to six Taiwan-based companies are negotiating for the acquisition of patented WLC technology with the aim of starting production in the first half of 2009. The companies include lens, image sensor and camera module makers. A WLC phone camera module may cost less than US$1, much lower than costs of VGA camera modules using a conventional processes. WLC thickness of 2.5mm is much smaller than that of 4.4-5.9mm for the conventional module. These makers plan to use WLC technology to produce VGA and 2MP phone camera modules, the sources noted. Now, the question is from whom these companies are licensing WLC technology. The only company openly offering such a license is Tessera. It's quite active in Taiwan, so I guess that Tessera will report about the new deals soon. There is a new AF camera-module company called LensVector. Started up in 2006, it still does not have the web site - quite unusual for the technology company these days. SPIE Works tells that the company "commercializing a breakthrough tunable lens technology for the camera mobile phone market" and has 20 employees. Another SPIE Works message tells develops a "new miniature liquid crystal based auto focus device for use in digital camera modules." The company is split between Mountain View, CA, and Quebec City, Canada. LensVector was founded by Tigran Galstian, Canadian University Laval Professor. Probably LensVector is a continuation of his previous work mentioned in The Register.